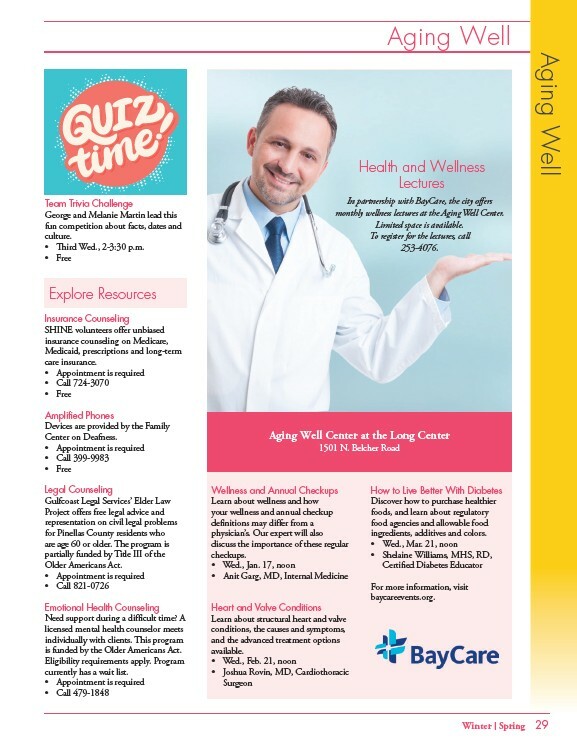 Health and Wellness In partnership with BayCare, the city offers monthly wellness lectures at the Aging Well Center. Limited space is available. To register for the lectures, call Winter l Spring 29 Team Trivia Challenge George and Melanie Martin lead this fun competition about facts, dates and culture. • Third Wed., 2-3:30 p.m. • Free Explore Resources Insurance Counseling SHINE volunteers offer unbiased insurance counseling on Medicare, Medicaid, prescriptions and long-term care insurance. • Appointment is required • Call 724-3070 • Free Amplified Phones Devices are provided by the Family Center on Deafness. • Appointment is required • Call 399-9983 • Free Legal Counseling Gulfcoast Legal Services’ Elder Law Project offers free legal advice and representation on civil legal problems for Pinellas County residents who are age 60 or older. The program is partially funded by Title III of the Older Americans Act. • Appointment is required • Call 821-0726 Emotional Health Counseling Need support during a difficult time? A licensed mental health counselor meets individually with clients. This program is funded by the Older Americans Act. Eligibility requirements apply. Program currently has a wait list. • Appointment is required • Call 479-1848 Aging Well Aging Well Lectures Aging Well Center at the Long Center 1501 N. Belcher Road 253-4076. Wellness and Annual Checkups Learn about wellness and how your wellness and annual checkup definitions may differ from a physician’s. Our expert will also discuss the importance of these regular checkups. • Wed., Jan. 17, noon • Anit Garg, MD, Internal Medicine Heart and Valve Conditions Learn about structural heart and valve conditions, the causes and symptoms, and the advanced treatment options available. • Wed., Feb. 21, noon • Joshua Rovin, MD, Cardiothoracic Surgeon How to Live Better With Diabetes Discover how to purchase healthier foods, and learn about regulatory food agencies and allowable food ingredients, additives and colors. • Wed., Mar. 21, noon • Shelaine Williams, MHS, RD, Certified Diabetes Educator For more information, visit baycareevents.org.